Today is the day! Not that there’s anything special about today, but today is the day I decided to dig up the sweet potatoes. And of course, today is the day I didn’t look at the radar. We’ve already had two or three downpours. Not the best weather for pulling sweet potatoes which need to cure in the sun for a day or two. Oh well. has a different look from the other darker-skin varieties. It is a white-skinned, cream-fleshed sweet potato that cooks up drier than other sweet potato varieties. O’Henry’s leaves are green and heart shaped. It’s large tubers grow in a compact cluster underneath the plant helping to make harvesting easier. O’Henry has a high yield potential and also stores well. Excellent taste. I don’t know yet about storage, but everything else is true. There are about half as many again still in the ground, so I’d call that a high yield. This year, I planted my slips– I think about eight or nine of O’Henry– in a rectangular planter in front of the house. We have two such planters; another variety is in the second. Sweet potato foliage is beautiful. Indeed, the sweet potato vine that folks plant as greenery in large planters really is a sweet potato– same species, different variety. (Note to the prepper/survivalists out there, the tubers of the sweet potato vine, while not as large as a variety bred for eating, are edible.) I had several reasons in addition to appearance for planting them in planters. First, I hoped it would be much easier to harvest the potatoes. It is. Second, I hoped the deer wouldn’t come so close to the house. They did. But another great thing about growing sweet potatoes is that even if deer strip the plants of almost all their foliage, it will grow back and the potatoes aren’t affected. Planting and growing sweet potatoes is remarkably easy. Several months of warm weather are required to produce the sweet potatoes biggest tubers. Northern growers can benefit from using black plastic to warm the soil for about 3 weeks prior to planting. Sweet potatoes should be planted in a ridge (raised row) to provide drainage and allow for root expansion. Space ridge about 3 1/2 feet apart with plants set 1 foot apart. Upon receipt of your slips, placing them in a jar of water until you are ready to plant will perk them up, allow you to wait until weather conditions are perfect for your area, and give you time to prepare your soil. Please note: Your plants may appear severely wilted which is normal, there maybe leaves that appear rotten or slimy and this is also a natural occurrence, just remove the slick or slimy leaves and place your plants in a jar of water as discussed earlier. Sweet potatoes are extremely tough and resilient plants and once livened back up will take off and grow well. Keep transplants moist after being set in the field and water before the soil dries. Weed control will be necessary until the vines meet between the rows. 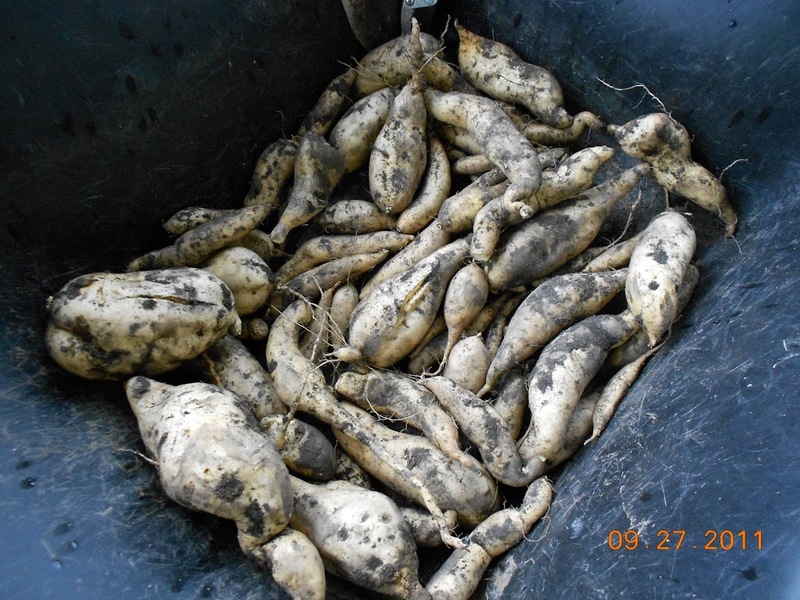 The photo shows sweet potato slips. Once you have established a first crop, you have your own slips. Not all of the sweet potato roots will produce tubers big enough to peel. Save those in a cool, dark place. When spring rolls around, set them outside in box or tray. Water them occasionally. After a while, they will begin to sprout, like old (real) potatoes do. Treat those sprouts as slips. Alternatively, just plant those old roots and water regularly until you see the plant popping out of the soil. Sweet potato plants are almost indestructible. Once the plants are established, they don’t even need to be watered. No pests. Never had a problem with disease. If you like sweet potatoes, grow your own.